Fat Facts: A healthy body needs some fat. 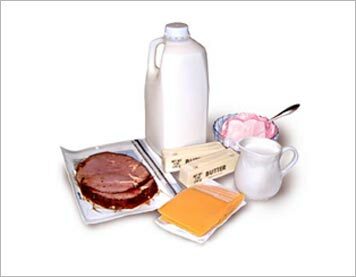 Most foods contain several different kinds of fat and certain fats should be part of a healthy diet. The type and quantity of fat ingested affects our health and our fitness goals. Our body uses fat as a fuel source and it is the major storage form of energy in the body for future use. It is stored in the body for many functions such as lubrication of joints, managing inflammation, brain functioning, building healthy cells and skin, regulation of body temperature, protective cushion for organs, absorption of fat-soluble vitamins, A, D, E, and K and production of hormones. These fats are associated with heart disease and high cholesterol levels. Butter, cheese, dairy fat, sausage, ice cream, cream, bacon, chocolate, egg yolk, full fat milk, vegetable oils such as palm oil, coconut oil (tropical oils) are some examples of saturated fats. However, including small amounts of saturated fats in your diet such as some lean red meat or egg yolks is beneficial depending on your lifestyle, current health status, fitness goals and overall diet. But they should make up only a small part of your daily fat intake. Most saturated fats tend to be solid at room temperature, with the exception of tropical oils. Polyunsaturated: These fats tend to lower blood cholesterol levels. They are liquid at room temperature and in the refrigerator. 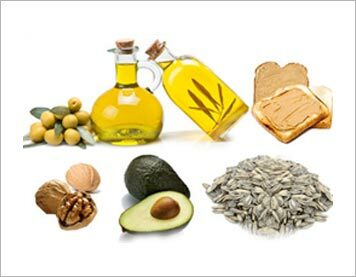 Common sources are flax seed oil, fish oil supplements, fish, soybean oil, corn oil, safflower, sunflower oils, many nuts and seeds and their oils. Monounsaturated Fats: These fats also have a positive effect on the good cholesterol levels and tend to lower the bad cholesterol (LDL) reducing the risk of heart disease and stroke. They are liquid at room temperature but start to solidify at refrigerator temperatures. 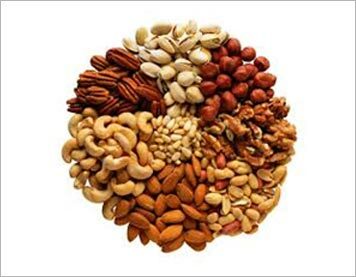 Common sources are olive oil, canola oil, peanut oil, natural peanut butter, olives, peanuts, almonds, cashews, pistachios, hazelnuts and avocados. The unsaturated vegetable oils when manufactured into solid form, turn into trans fats. Trans fat is found in hundreds of processed foods usually to protect against spoiling and to prolong the shelf life and to enhance flavor and taste. Some examples are biscuits, crackers, pastries, pizza dough, corn chips, cookies, cakes, margarine, etc. 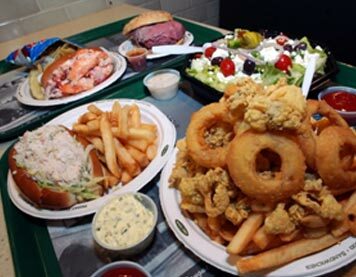 Restaurants use a lot of trans fat especially in fried foods like fried chicken, french-fries, chicken nuggets, onion rings etc. No amount of trans fats is healthy. Trans fats are even worse than saturated fats. They hinder in the fat burning process and are detrimental to your health contributing to major health problems, from heart disease to cancer. Importance Of Fats In Fitness Goals: Right amounts of the right fats in the diet can help you gain muscle and lose fat more easily. The key is a balance between saturated,polyunsaturated and monounsaturated fats. Zero fat or very low fat diets can derail your fitness goals. To be in great shape, the timing and amount of fat consumption is very important. Fat provides the main fuel source for long duration, low to moderate intensity exercise. Even during high intensity exercise, where carbs is the main fuel source, fat is needed to help access the stored carbs (glycogen). Optimal Fat Needs: 20%-30% of your calories should come from good fats to maintain your health. Any less than 20%-30% and your hormonal production will go down and any more than 20-30% you will start accumulating plenty of body fat. However, guideline for fat intake needs to be customized depending on the lifestyle, weight, age, goals and state of health. The Bottom Line: The answer is not cutting out the fat – It is about getting the right balance in order to ensure you get benefits without the potential problems.